Dodder colonizing a weedy host in the Willamette Valley, note the orange-colored threadlike stems of dodder. 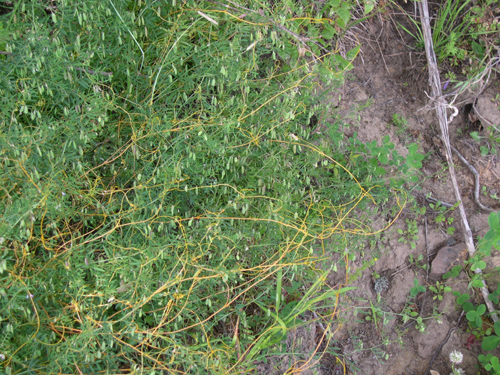 Closer view of dodder, note the orange-colored threadlike stems of dodder. Cause Annual, parasitic seed plants belonging to the genus Cuscuta, which live on clover and other plants including commercial crops and weeds. 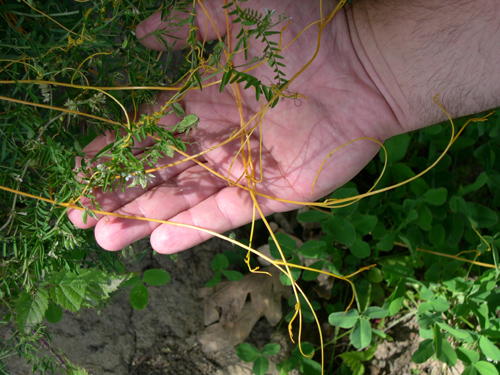 Dodder plants consist of rootless, leafless stems that encircle and penetrate clover stems, diverting host nutrients. Dodder is favored by high temperatures and full sunlight. Dodder seed can remain viable in the soil for 20 years. Dodder seeds are gray to brown, irregularly round with a rough surface texture, and are similar to clover and alfalfa seed in density. Symptoms A tangle of leafless, thread-like stems that are yellow, orange, purple, or white, entwine clover stems. Tiny white, pink, or yellowish flowers in clusters appear in June; seeds are produced from midsummer until frost kills the plant. Cultural control See also the PNW Weed Management Handbook for additional information. Plant seed free of dodder seed. Do not spread manure or hay with dodder in it. Do not graze dodder-infested areas and then put animals on clean land. Avoid spreading dodder seed in irrigation water. Cut dodder-infected plants before they develop seed.